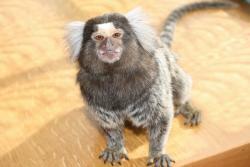 Story This is Zeus my marmoset monkey he is to addorable he is like one of my own children. He has a inside huge cage with lots of toys ropes and a cozy little home were he and his teddy doe doe with nice soft cuddly blankets. He has another cage which is outside for he needs alot of sunlight for his bones. He gets his vitamin syrup once a week and he loves jelly and marshmellow bottles as a treat. Likes Been outside sweets and coffee all the thins he shouldnt have.